Ryerson graduate students, faculty and staff who hold active library cards may book programs for classroom use. Please allow at least one business day’s notice when booking material owned by the Library and, if possible, book only for the date of class showing. Faculty are advised that early bookings are the only way that they can be sure of the material being available. 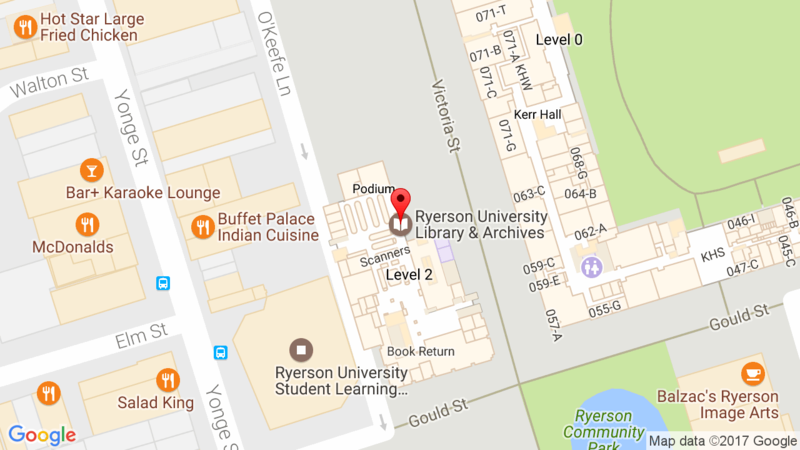 Ryerson Library reserves the right to recall booked or signed out AV items when necessary. Material may be picked up on the day of the booking at the Circulation Desk and must be returned on or before the due date. After hours, AV material may be returned through the book drop. Visit the Circulation Desk on the 2nd floor of the library during AV office hours. Film reels are now located in Special Collections, on the 4th floor. Faculty with active library cards may book 16mm films for a maximum of 2 days for screening in classes. Please allow 2 business days notice to process requests. Booked films may be picked up at the Circulation desk on the 2nd floor. To book, please email specialcollections@ryerson.ca. Material that is not available in the Ryerson AV collection may be obtained from external collections, including those of other Ontario universities. Ryerson students, faculty and staff who hold active library cards may book programs from other collections. Two weeks’ notice is required to book external items. The University of Waterloo Audio-Visual Services database incorporates information about the video and motion picture holdings of most of the universities in the province of Ontario, including Ryerson. Connect to University of Waterloo Audiovisual Services (WATMEDIA). Enter keywords or a specific title and search all institutions or use the drop down box “Office” to select a specific institution.